Good SEO comes with Good Content, Everything else is just tricks that work(ed). Have you launched a website for your business or organization, but aren’t able to reach your target audience? Your website needs effective positioning through Search Engine Optimization. Keeping the technical jargon aside, SEO simply refers to the process of generating the maximum possible traffic from your target audience, which will help take your business to the next level. Quarter Pie Interactive, an SEO Company based in Gurgaon – has mapped a very detailed Standard Operating Procedure (No Tricks) for this process and the performance of the team is linked to the client’s objectives and results through it. With the search engines getting smarter with every update, Pandas and Penguins combined with Social Media tracking by crawlers, the search algorithms are making it hard for those who tricked the search engines easily with Link Building and Keyword Stuffing till a few years back. 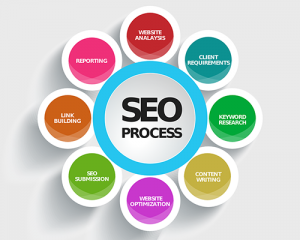 We are, indeed, one of the best SEO Company in India due to our unique search engine optimization approach that starts from understanding your company, brand, products/services and the overall marketing strategy and then helping you in identifying digital missions to maximize your RoI. We clearly map the “Current State” of your business by deeply looking at the data sets and numbers before we strategize to reach the “Future State” of your business operations by leveraging on SEO efforts at various search engines. We will be able to assist you in understanding things about your website that you may have never looked at, before. From collecting vital information to generating key reports, analyzing your competition and their activities on the web; we then create an effective SEO strategy based on this SWOT Analysis. Our efforts would then be targeted to enhance your brand awareness, increase sales, lead generation or helping the online users consume information they are searching for or trigger buying process for your products or services. On-Page optimization deals with the highly technical aspects of your website like Content Optimization, Tags Optimization, URL Writing and Mapping etc. From checking your website for duplicate content to internal linking, Being one among the best SEO companies in India, we can help bring about a positive change in your website’s ranking in record time. Some key one-time activities performed at this stage for your current website pages include RSS Creation, Broken link checks, creating XML Site-map etc. As a leading SEO company in NCR Region, we offer off-page optimization to take your business to greater heights, by working with the content of your website, along with giving you the necessary exposure. In SEO lingo, “Content” is the king and we have a team of experienced writers in-house and outsourced vendors who deliver high-quality content as per the Content Plan. The content pieces are then checked and coded in a standard naming convention and stored smartly in our knowledge systems for all references. We have very strict semantic guidelines for our writers and we provide timely coaching & feedback if the need arises due to issues with the content quality. We can help you meet your content requirements by offering you top-notch quality Articles, Press Releases, Guest Blog Posts and other content that you might need to create waves. We will also assist you in generating Google Analytics reports, along with a monthly SEO work report. Keyword reports and an achievement report will also help you in staying connected with our efforts aligned to your business goals. We do Performance Check very frequently and proactively scope the areas that need more attention and yet we celebrate on achievements for our clients.